Cord Garcia won the latest event at the 2015 World Series of Poker, and it was one for the record books. The Houston native had a career day, earning $638,880 dollars in the biggest live tournament of all time. 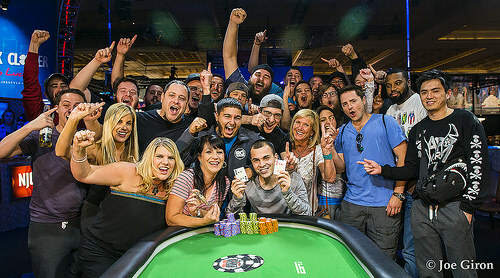 Remarkably, this is the first WSOP cash of Garcia's career, and he sure made it one to remember for the family and friends that lined the gallery around the final table. Garcia has come a long way in his relatively short career. He started playing in underground games in the Houston area before he was old enough to play legally, then starting grinding the mid-stakes tournament circuit when he turned 21. Now, as a 25-year old, he's won a record-setting tournament, and one event he more than doubled his career tournament earnings. "Definitely" Garcia said when asked if this is breakthrough moment. "It feels like it is my breakthrough, but at the same time, I feel like I am capable of doing bigger things." It's hard to get much bigger in poker, though. For about seven weeks every summer, the convention rooms at the Rio All-Suite Hotel and Casino take on a carnival-like atmosphere as tens of thousands of poker players from across the globe descend like a swarm of locusts on the world’s largest temporary poker room. But on Friday, May 29, the fevered pitch of the WSOP carnival reached unprecedented levels as this new tournament made poker history. The hallways were overcrowded, the poker tables were filled to capacity, and line for tournament registration was longer than anyone could remember. Several players compared it to waiting in line for a roller coaster at an amusement park: hours of anticipation for a (hopefully) unforgettable experience. The Colossus is a new addition to the WSOP schedule—it featured a buy-in of $565, the lowest for an open event at the World Series in over three decades. There were also four starting flights (two on Friday and two on Saturday), and if players were eliminated, they were able to re-enter in a later flight. More importantly, it carried a guaranteed prize pool of $5,000,000. It would take 10,000 just entries to meet the guarantee. Yet before this event, the largest live tournament ever held had only 8,773 entries (this was the 2006 WSOP Main Event). The Colossus would have to be the biggest poker tournament ever – in terms of number of entries – just to meet the guarantee. It turned out that wasn’t a problem, and it wasn’t even close. Over the course of four starting flights, 22,374 entries participated. It broke the record for biggest live poker tournament ever by more than 150%, and the total prize pool was $11,187,000—more than double the advertised guarantee. The number of entrants absolutely demolished the previous record for biggest tournament. So much so that Nolan Dalla, longtime poker writer and unofficial WSOP historian, compared the new mark to Cal Ripken breaking Lou Gehrig’s record for consecutive games, Barry Bonds eclipsing Hank Aaron for career home runs, and Joe DiMaggio setting the record for consecutive games with a hit. Garcia defeated Brad McFarland heads up. It was a career day for McFarland, too. McFarland is an online poker specialist, and before today his best live cash was only $30,000. Today he won more than ten times that amount. Garcia and McFarland seemed destined to play heads up after Garcia won a three-way all in hand with only four players remaining. He eliminated fourth place finisher Paul Lentz, and left eventual third place finisher Ray Henson short-stacked. The atmosphere on the ESPN Main Stage was tense as play began on Wednesday. The difference between a ninth-place finish and victory represented over $570,000. Even so, action got off to a fast start, and spectators saw the first final table-elimination on just the sixth hand of the day. Anthony Blanda, who started the day in eighth place, moved all in with , and Brad McFarland called with pocket sixes. The board missed both players, and Blanda was eliminated in ninth place for $67,681. This is just the fourth WSOP cash of Blanda’s career, and it’s by far the biggest. Before today, he had about $8,000 in live tournament earnings, and he won more than eight times that total in this event. Blanda wasn't alone in having a career day. With only one exception (Ray Henson), all the final tablists had the best live tournament cash of their careers. Many of the faces at the final table were familiar to anyone who keeps a close watch on the World Series of Poker Circuit and other mid-stakes tournament series. Third-place finisher Ray Henson has four WSOP Circuit rings on his poker resume, and he’s no stranger to tournaments with massive fields. He won the biggest event in WSOP Circuit history, the $365 re-entry event at Choctaw, Durant this past January. A total of 4,053 entries participated in that event, a massive field by virtually any standard…unless it’s being compared the Colossus. It would have seemed fitting for Henson to win today, making him the champion of both the largest event in WSOP history and the largest event in WSOP Circuit history. However, he fell just short with his third-place finish. Even so, he now holds a unique record, having bested 26,423 opponents in only two events. Given the rarity of poker tournaments this big, it’s a record unlikely to be broken soon. Henson first caught the attention of the poker world in 2007, when he made a deep run in the WSOP Main Event. He just barely missed the final table, finishing in 12th place for nearly $500,000, the only score of his career bigger than the $308,761 he earned for his performance in the Colossus. Remarkably, one of Henson’s best friends was sitting across from him at this final table: the eventual winner Cord Garcia. Garcia had a WSOP Circuit ring of his own and 15 Circuit cashes. However, this is Garcia’s first cash at World Series, and he made it a good one. Garcia and Henson are actually rooming together for the WSOP, and just a week after the 2015 World Series began, they’ve set a high standard for the summer’s most successful poker house. Cord credits his burgeoning friendship with Henson - as well as their other friends in the game - with helping him improve his game and achieve this breakthrough performance. "Over the last year and half, Ray and I have gotten a lot closer," Garcia said "I was grinding in Houston in the underground scene when I was underage, as early as 15. I knew Ray back then, but that was the year he ran deep in the Main Event, so he was kind of big time. He was someone I looked up to but I didn’t really know. Maybe if I was lucky I’d run into him and maybe talk to him. The last year and a half, though Ray and David Baker [ODB], I’ve gotten a lot closer with, and there’s a lot to learn from them." And then there’s Aditya Prasetyo (“Adi,” to his friends). Prasetyo entered this final table with over $500,000 in career earnings, 8 WSOP cashes, and 2 WSOP Circuit rings. His best live cash was about $125,000. Prasetyo entered today with the chip lead, and extended that lead during the first few hours of play at the final table. At one point with six players remaining, he held almost half the chips in play. But a few hands went against him, and he ended up finishing in sixth place for $140,956. Much like Garcia and Henson, Prasetyo is rooming for the summer with a fellow grinder who made a deep run. His roommate is Valentin Vornicu, a six-time WSOP Circuit ring winner who finished in 96th place ($9,307) in the Colossus. The lone non-American at the final table was Kenny Hallaert, from Belgium. Hallaert had one of the final table’s most vocal cheering sections, a throng of Belgian and Dutch players and fans that included 2014 November Niner Jorryt van Hoof. Hallaert is familiar with major poker tournaments, as he works as a tournament director as well as playing the game. His deep run today was cut short when his pocket tens were outdrawn by Ray Henson's pocket fours. Seventh-place finisher Garry Simms, from Shelbyville, Ky. has a Circuit ring of his own, and before today, that $38,000 victory was the best result of his career. Now the 30-year old who learned to play poker from his father has a six-figure score ($109,632) in the biggest tournament in WSOP history. David Farber finished in eighth place ($87,817). Farber, a 36-year old father of two, has two previous WSOP cashes, although this is his first since 2009. And like everyone else at the final table, this is the biggest live tournament cash of his career. At 10 a.m. on Friday, 5,173 players took their seats in the first starting flight. After eleven levels of play, only 804 survived. Later that day, at 6 p.m., another 5,029 entries started playing. Then on Saturday, the 10 a.m. flight drew 6,283 players, and the 6 p.m. flight drew 5,889. In total, 3,448 players survived their Day 1 flights and returned on Sunday for Day 2. This was the day the money bubble burst. It was a scene unlike any other in WSOP history, as nearly 2,500 players in the same event crowded into the Pavilion room at the Rio, just a few minutes away from making the money. Tournament staff stopped play with 2,246 players remaining to start hand-for-hand play at over 200 tables. On the first hand, there were nine simultaneous eliminations. The nine players eliminated on the bubble split the bottom four pay-spots, and all remaining players were guaranteed a payout of at least $1,096. By the end of Day 2, only 506 players remained. Day 3 (Monday) saw the elimination of most of the rest of the field, as only 39 players made it to Day 4. A plethora of well-known players made deep runs in this event, and Day 3 saw the eventual eliminations of November Niner John Racener in 54th ($19,566), Will Givens in 58th ($16,702), Zo Karim in 60th ($16,702), Yuval Bronshtein in 64th ($14,330), Jessica Dawley in 68th ($14,330), Valentin Vornicu in 96th ($9,307), Dan O’Brien in 108th ($8,155), Lee Watkinson in 57th ($8,155) and Jeff Gross in 180th ($8,155). And on Day 4 (Tuesday), Caufman Talley (17th place, $38,639) and Mike Leah (39th, $23,022) were eliminated as the 39 remaining players were whittled down to the official final table of nine. The 22,374 entries include 14,284 unique players. They came from 98 countries, a WSOP record for a single event. There were 5,664 players (39.6% of unique entrants) who had never before played in a WSOP event. The players’ ages span over 75 years. The oldest player in the event was Norman Spivock (96 years, 2 months). At the other end of the spectrum, the youngest players were David Barclay and Noah Goldman, both of whom were 21 years and 1 day old when the tournament began. The average age of all participants is 41.95 years. From May 28 to June 3, the event used 362,425 physical poker chips, 982 dealers, and 4,480 decks of cards. Garcia opens the button to 3,000,000 and McFarland defends his big blind. He then checks the flop, with Garcia continuing for 4,100,000. McFarland calls. The pairs the board on the turn. McFarland checks for a second time and Garcia shoots a few looks across the table before cutting out a bet of 8,400,000. It's McFarland's turn to stare across the table, as he goes into the tank and calls. The completes the board and a potential flush draw. McFarland checks for a third time. Garcia fires a third bullet, sized at 17,500,000. McFarland announces "all-in" and Garcia snap calls, quickly tabling . McFarland is left shocked, flipping over his own . The counts were close before the hand began, but after some quick counting by the dealer and staff, it's confirmed that Cord Garcia has McFarland slightly covered and is the 2015 'The Colossus' champion. He will make $638,880, while McFarland takes home $386,253 for his second place finish. McFarland opens the button to 2,000,000. Garcia calls. Garcia checks the flop, with McFarland continuing for 1,600,000. Garcia calls to see the come on the turn. Garcia checks again, with McFarland betting out 3,900,000, which is good enough to take down the pot. McFarland is now playing close to 55,000,000 with Garcia holding a slight advantage with 57,000,000. McFarland gets a pass in the big blind. The flop falls and Garcia check calls a bet of 1,600,000. The brings another check from Garcia, with McFarland checking behind to see the fall on the river. Both players check and Garcia tables which is good enough to take down the pot. Garcia takes down the pot with a 3,000,000 chip bet from the button. Garcia takes down the pot with after opening for 3,000,000. McFarland takes down the pot with a 2,000,000 chip bet. Both players see a flop of after McFarland limp, calls a 3,000,000 chip bet from Garcia. Both players check and see the fall on the turn. Both players check again. 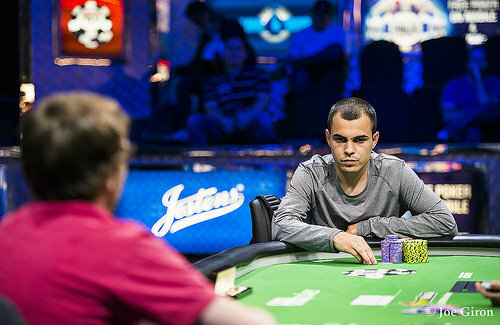 The completes the board and McFarland folds to a 2,000,000 chip bet from Garcia. Brad McFarland gets a walk in the big blind. McFarland limps the button and Garcia checks. Both players check the flop. With the coming on the turn, McFarland bets 1,300,000 but Garcia check-raises to 3,300,000 and forces a fold. Garcia opens the button to 3,000,000, with McFarland defending his big blind. The flop gets checked by both players, with the falling on the turn. McFarland checks for a second time and Garcia follows suit. The completes the board and brings a 3,300,000 bet from McFarland. Garcia calls and McFarland tables , which is good enough to take in the pot. McFarland is now playing just shy of 60,000,000. Both players check the flop, after McFarland limped the button pre flop. Garcia then check calls a bet of 1,600,000 after the falls on the turn. The completes the board and Garcia checks again, only to see McFarland push out a bet of 4,800,000. Garcia folds to award the pot to McFarland. Garcia opens to 3,000,000 on the button and McFarland calls. McFarland then check calls a bet of 3,700,000 on a flop of . He checks for a second time as the falls on the turn, with Garcia betting for a second time, pushing out 9,100,000. McFarland's eyes get wide but he pushes his cards away from his stack, sending the pot to Garcia. He checks the flop and McFarland bets 1,100,000 after the board falls, to take down the pot. Brad McFarland gets a walk. Cord Garcia opens the button to 3,000,000. Brad McFarland folds. There are 42 minutes left in Level 41. Both players check the board down the river, with Brad McFarland winning with king high. The players are now on another break, this one of the 10 minute variety, with an updated list of counts coming shortly.